Our designer allows for the creation of either form or label designs taking data directly from the production job or from any of the data set up for part in the part database. The easy to use designer is supplied with a variety of templates for use as a starting point to help you get up and running quickly. The form or label designs can be previewed to see what the design looks like before its printed. Run based customised forms can be accessed directly from review runs. 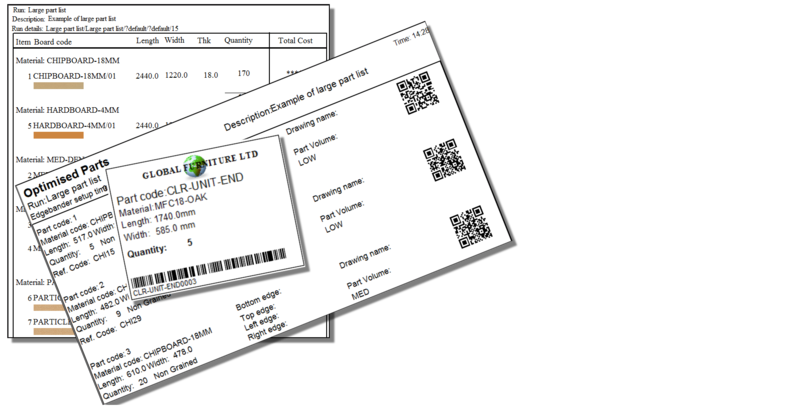 1D and 2D barcodes are available for both forms and labels. Grid, guidelines and snap options are available to help place items on the design. Quick Preview and Data Preview view options provide accurate checks of the layout design. Each label or form is fully customisable. Different templates with alternative designs and styles are supplied that can be reviewed and altered. Produce custom labels or route cards with bar codes for easy identification and tracking of parts, or custom forms for internal reporting and customer facing purposes. With a powerful drag and drop interface, labels and forms are easily tailored to your requirements.